As you all probably expected., the SplinterBike ultimately suffered irreparable wear and tear during the attempt and limped into the pits. It's not over though, SplinterBikeThree is on the drawing board and will reveal itself early 2012. The speed to beat has been officially recorded and now we want to get closer to the 50kph 31mph goal which is theoretically achievable. 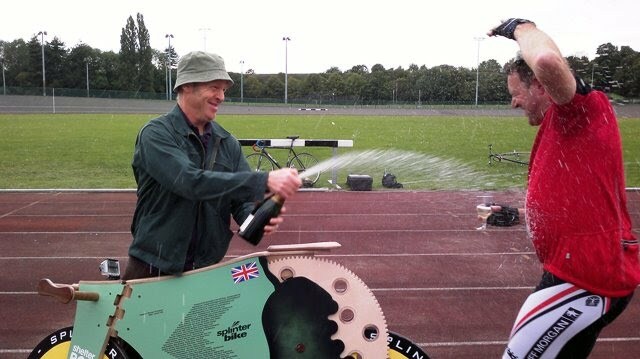 If you or anyone you know would like to put down that remote control and get up from that armchair and have a go at building a 100% wooden bicycle, then please let us know as we would like to have an annual event where we can compete on an even playing field/runway/velodrome to raise the wooden bar in timber engineering. In the meantime, visit the speed record gallery page and listen to James on Run 2 as he trundles past the officials and lets us all know what it feels like to have 256 wooden gear teeth rattle beside his manhood!